You are not alone in having no earthly idea what a serum is, let alone why you need one in your skincare routine! But, we are here to tell you that whatever your concern may be, there is a serum designed to target and help control it. Serum is a skincare product you can apply to your skin after cleansing but before moisturising with the intent of delivering powerful active ingredients directly into the skin. Serums are particularly suited to this task because they are made up of smaller molecules that can penetrate deeply into the skin and deliver a very high concentration of active ingredients. Acne-prone serum advice: Look for vitamin C (increases collagen production, enhances skin’s repair process, and reduces inflammation), retinol (also an antioxidant, reduces inflammation), zinc (soothes irritation, regulates oil production), and salicylic acid (unclogs pores). 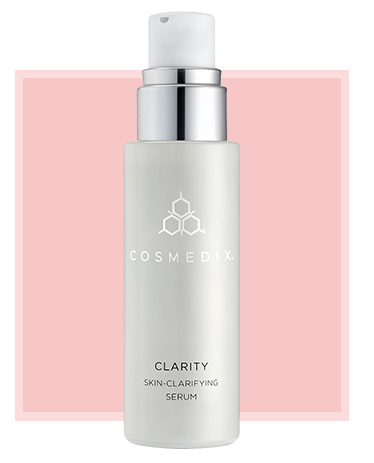 This serum is a unique and very effective blemish fighting product, formulated without irritating ingredients. Designed to calm, correct and support the skin. Formulated with Salicylic Acid & Pregnenolone to deeply exfoliate skin, eliminates impurities and balance oil production. Blended with L-retinol A to promote cell re-growth and restores clear, smooth, refined and healthy looking skin. Dry/Dehydrated serum advice: Look for vitamin E (an antioxidant, protects cells from oxidative damage), niacinamide (improves skin elasticity, increases ceramide levels in skin), glycolic acid (gently exfoliates and lightens discoloration), and hyaluronic acid (retains moisture). Saturate skin in serious hydration with this intensive treatment serum; a must-have skin care staple for dehydrated, fatigued skin. Formulated with dehydrated, lacklustre complexions in mind, this hydrating treatment serum works to combat the look and feel of dry skin. Powered by Perricone’s proprietary H2 Energy Complex™, this lightweight serum penetrates the surface layers of the skin to replenish moisture, refine texture, minimise stress and boost radiance. The result? A plump, supple and smooth complexion that radiates luminosity. 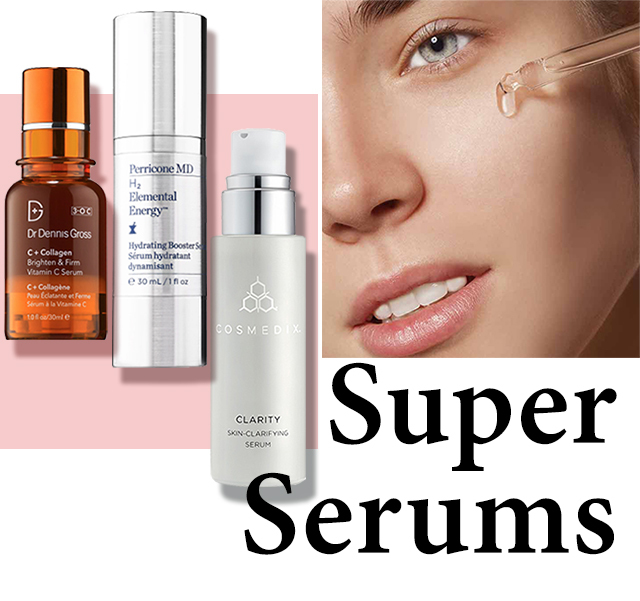 Feeling dull serum advice: Look for antioxidants like vitamin c, green tea extract, resveratrol, ferulic acid (these combat free radicals, increase effectiveness of sunscreen by day, and promote cellular repair and healing by night). This serum brightens and evens out skin tone. Similar to using a vitamin C supplement when you’re feeling unwell, it can also boost the immunity of your skin, act as an anti-inflammatory and it’s also a powerful anti-oxidant. Dr. Gross has taken the most stabilised form of vitamin C, combined it with a brightening complex, carnitine and lactic acid to create a serum that instantly wakes up your skin. Formulated with a cocktail of skin-revitalising actives, this fast-absorbing serum delivers flawless skin. It is an energy-boost elixir that repairs imperfections and recharges skin to restore a healthy-looking glow. Formulated with collagen amino acids, vitamin C, coq10, superoxide dismutase, carnitine and niacinamide to strengthen, soften the appearance of wrinkles, banish dark spots and boost radiance. Signs of ageing serum advice: Look for a cocktail of retinol, vitamin C and vitamin E to kick-starting the synthesis of elastin and collagen to promote your skin’s ‘bounce’, resilience and youthful lustre. 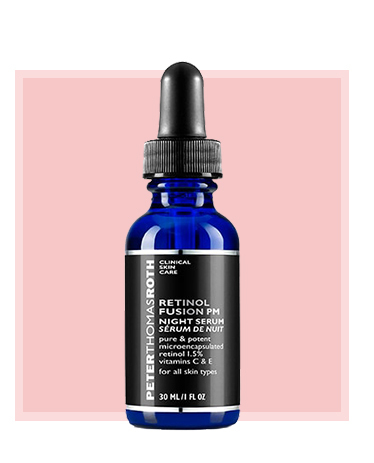 This serum harnesses the youth-boosting properties of retinol (without the ‘irritating’ side-effects) in featherweight, deeply penetrative texture that absorbs almost instantly to “politely push” lazy skin cells into action – stimulating manufacture of essential building blocks which maintain your complexion’s ‘stretch’ and density. 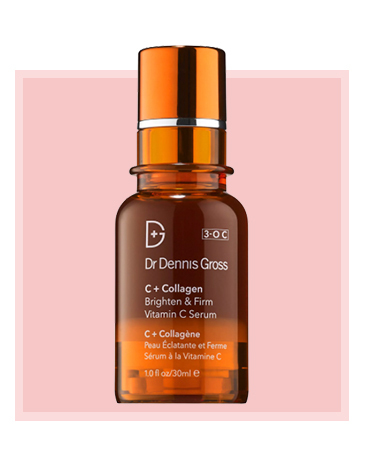 Vitamins C and E combine to neutralise the cell-ageing effects of everyday environmental stress while fortifying fragile fabric to delay development of fine lines and wrinkles, while a blend of hydrating and conditioning extracts works to negate the typically drying properties of retinol, so your face feels firm with an enviably dewy smoothness.